House N Home Building publishes a monthly e-newsletter that features timely and topical articles pertaining to the building of new homes. The annual subscription price is $37. Learn how to save thousands-- and still use your own builder! Your building guide is the BEST! Your building guide is the BEST! In the past I have purchased a few books on "how to build or how to be your own GC" but nothing has compared to your product. I loved the fact I could download it and modify the Specifications to my own needs. It was EXACTLY what I was looking for. It tells me the process step by step and examples of building materials. I got all your documents and they are great. We met with the builder and things are going fine. We picked a VERY reputable builder and I think that's 75% of the battle. …Everything else is great though. The builder's 1st draft was set up almost exactly like your samples and his specifications were almost uniformly the same as yours. Thanks again. I am finding it very useful and full of common sense information. There are some invaluable questions to ask your builder and things to look out for. Just dropping a note to say "thanks" for such a great resource. We bought your guidebook prior to our building our new home and I have to say that it's been an indispensible reference and guideline for us. Your newsletter is great as well and a welcome bit of email every month. Keep up the excellent work! Thank you so much for your excellent book! The MS Word file attachment was no problem at all to download and my husband and I are benefiting from every page of it! As we both agreed, it's not necessary to waste two hundred pages of printing when you get to the point with a simple, straight forward approach. Thanks again! Thank you for the shipping information. Thus far, I'm quite impressed with the value and info content of your HnH writings. 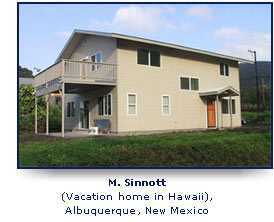 Am building a custom retirement home on 35 acres in SW Colorado next summer, so the information is very timely for me. I'll carefully select a General Contractor in the Pagosa Springs area using your suggested guidelines. So few companies go the extra step. I truly appreciate your extra efforts to send the hard copy to us as well, which was received yesterday in the mail. In today's time, so few companies go the extra step to remedy a situation, it is nice to know there are still some out there that go above and beyond. Thank you! I have purchased your guide and it has been a god-send!! My question to you is about stand alone ranges, particularly does the grease and other cooking odors get into the rest of the home? There is no place to put an overhead hood and was wondering what your experience has been with them. Thanks in advance for your time. I have read your Guide and found it very informative. I have not yet begun to build my house yet, but hopefully within the next year or two. I am quite sure that your guide is going to save me thousands of dollars. Will show you how to save thousands when building your new home without being the general contractor. 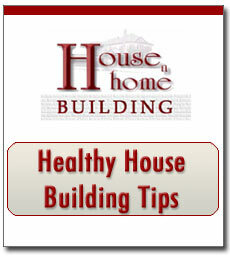 Contains important healthy house building tips that will help you build a healthier house. This is especially important information for those with allergies or other chronic illnesses. Comes with a straight forward guarantee, either you are satisfied or you get your money back. Arms you with information and tools that will help you avoid the house building horrors and give you peace of mind. Can be ordered online and downloaded immediately. No waiting around for your order to arrive. Get started now. The House Building Guide has been almost a decade in the making. Back in the early 1990’s my wife and I were living in an old Victorian home built in 1888. It was loaded with charm, but short on modern amenities. One day she was taking her winter coats out of a closet where they had been stored over the summer. She discovered, much to her surprise, that the linings of these coats were covered with mold. Within two days she had moved out; she is extremely allergic to molds and was having some health problems at the time. She moved in with her parents and I was left to sell the house, which I was fortunately able to do in a few weeks. We began looking for a house to buy. After some amount of looking and discussion we agreed that we would instead, build a house. Unwittingly, the saga that would lead to the publication of this guide had begun. We went through all of the normal steps of buying land, designing the house, selecting a builder, securing financing, overseeing the building process, and finally 17 months later, after taking our builder to small claims court, we moved in. Thankfully we did a lot of things correctly. But, unfortunately there were many things we should have done differently. As soon as we had finished the process I wrote about 9 pages of notes for myself to use when we built our second house. About this time a baby came into our lives and my notes went into a file and stayed there for more than six years. The Internet had blossomed during those six years and I recognized the potential value of the education I had received in the “school of hard knocks”. At the same time I was somewhat uncomfortable with presenting myself as an expert in the area of house building. I decided to see what information was available. I went first to the Internet and bought almost every new house building guide I could find and read them. I was quite surprised at what I found. The information fell into two basic groups. One group provided only a general overview of the home building process, with a few checklists and timetables, but overall was really pretty useless. The second group attempted to teach consumers how to be the GC and save money by taking on the role of a builder. Next I went to Amazon.com and bought several books on building a new home. Once again I found that many of these were written by builders. And once again I found that, while there was some good information in these, none of them contained what I considered to be the most critical information, i.e. how to save thousands of dollars when building a new home without being the GC. In my mind this was the most critical detail and no one was writing from that perspective. Having finally convinced myself that the information I had compiled was important, generally unavailable elsewhere, and could save the homeowner a bundle, I made the decision to write the House Building Guide. 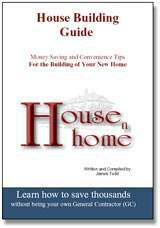 The House and Home Building Guide will show you how to save thousands of dollars on your building project. If you are building an average sized house in the U.S. (~$150,000) you should be able to save $5000-$10,000 or about 5-10% of the construction costs of your home. The best part is that you can realize these types of savings without being the General Contractor (GC) on your house building project. This is an extremely important point because being the GC on a house is almost a full time job - and few people today have that amount of free time. Furthermore, even if you were one of the lucky few who had the time, without the practical experience, you would have a very difficult time managing the process. For most people the bottom line is that a builder, whom you hire, will be responsible for all of the nitty gritty details of getting the house built - not you. He is your house building expert and you should use him for his expertise. By putting into practice the tips in the House Building Guide you should easily save 50 fold the purchase price. In fact if you followed through on just one of the money savings tips contained in the Guide, you would pay for its cost many times over. This analysis doesn’t even take into consideration the value of the many convenience tips. What else could you ask for? Here is a quick look at just a few of the other things contained in the Guide. Why builders love change orders and why it is so critical that you have as few of these as possible. Why all warranties are not alike and what kind of warranty you must avoid. Why homeowners have the leverage in the building process. How to achieve “apples to apples” comparability when requesting bids from builders. Two things you can do yourself and save money. Five things you can delay or postpone if you are running short on money. 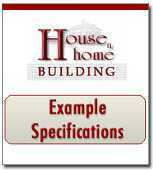 Why your specifications must be as detailed as possible. Twelve (12) major items on which you can easily avoid a builder’s markup. Why you need a good builder. Why 98% of people shouldn’t be their own GC. What questions to ask when interviewing a builder. How to audit a prospective builder’s construction site. The best and easiest way to develop your floor plan. Twenty-nine convenience tips that could save you thousands of dollars and hundreds of hours over a lifetime. Why the right credit card is important and how it could save you hundreds of dollars. How a call to your local electrical utility might pay for the cost of this Guide 5-10 times over. Which clauses are important in a house building contract. An easy way to enforce your contract if the builder doesn’t live up to his end of the bargain. How to assemble your punch list. Thirty (30) important questions to examine when buying land. How to easily check if land is near an environmentally contaminated site. Why a credit check on both yourself and your prospective builder is important. The information contained in Healthy House Building Tips will surpriseand alarm you. Everyone who is building a new house should be aware of the things contained in this document. For those with allergies, chronic illness, multiple chemical sensitivities, asthma, or respiratory illness this information is absolutely essential. The bottom line is that two trends in house building have converged to make the typical new house constructed today less healthy than it was 50 years ago. These trends are the increasing tendency to use man made materials and the construction of “tighter” homes with less outside air exchange. Did you know that the indoor air quality in most new homes is 5-10 times worse than outdoor air, even in the most polluted industrial areas?That is why the information found in the Healthy House Building Tips document is so important. Here is an example section. "Perhaps the worst offenders when it comes to building healthier houses are carpets and specifically man-made carpets. They can contain a variety of substances that outgas for many years. These gases are precisely what you are smelling when you enter a carpet store or a newly carpeted room. The many nice features you can purchase for carpeting such as color fastness, stain proofing, fire resistance, etc. are achieved by the use of chemicals. Carpets outgas these chemicals at the highest rates for the first few years but continue slowly for many years thereafter." The good news is that if you are aware of the air quality problems associated with the normal new house construction project, much can be done to mitigate these problems, and at a reasonable cost. Each month we publish a newsletter that addresses the topics of indoor air quality, home building convenience items, and money saving tips. You can subscribe to this newsletter by providing the information requested below. This is a private mailing list, and will never be sold or given away. You can unsubscribe at any time. This is my first newsletter, but I find it excellent. I can already see that it is going to address many of the issues that concern me and my wife as we begin to build our dream house in the Napa Valley,... Thank you. When I wrote this Guide I never anticipated it would be so popular. With thousands of satisfied customers, we have a growing list of testimonials and more recently, pictures of homes built by purchasers of the Guide. I have many people who email me and ask if I think the Guide will be of assistance in their particular situation. My response has been and continues to be: buy it, try it and find out for yourself. If you don't think it's worth the price, then return it and your money will be promptly refunded. We even have testimonials from people who have returned the Guide - and were pleasantly surprised how quick and painless the refund process was. As you embark on one of the most rewarding and financially important projects of you life, I wish you the best of luck with your new house building adventures. p.s. For a limited time, I am also throwing in a free house plan. I know that one size does not fit all, but for those customers interested in this type of plan it’s an amazing free gift. I spent more than $600 to have these plans drawn up. This is a value of at least $500, and probably hundreds more judging by the prices for similar plans on some of the House Plan websites. It’s a tremendous bonus gift (Click for the free house plan details) that you will not find anywhere else, but I can only guarantee this gift if you act within the next 4 days. It has been five years since we first started selling Guide. Since that time we have continually updated and added to the information. In fact, we have added five new documents and tools to the Guide within the last few months, yet the price remains the same as it was five years ago, $29.95 for the downloadable version. Our nearest competitors are charging from $47-69, and quite frankly, sometime later this year we are going to raise the price to at least $47 to match our competitors. The implementation of just one of the money savings tips discussed in the Guide could save hundreds of dollars-- and the total value of all the money saving and convenience tips is easily in the thousands. In addition, all of the other documents that we have bundled with the Guide (described below) have significantly increased the overall value of the Guide. If you were to purchase these documents from other sites on the Internet you would pay more than the $29 cost of the Guide just for a single document. Moreover, some of these documents and tools are not available anywhere else. To give you some idea of what these documents and tools might cost you elsewhere we have provided and estimated savings for each. I have included with the Guide an example set of specifications and a sample house building contract. Specifications are the details behind the blue prints that define specifically what is to be built. For example, let’s take the doors shown in your house plan. Specifications will tell you what color, size, and materials they are to made from, what kind of hardware they will have, whether they are to be painted, whether they will have door stops - and if they are - what kind of stops these will be. Are you beginning to get the picture? Without good, tight specifications, your builder will have a lot of latitude in deciding how your house will be built, and it’s a good bet that you will not be thrilled with his choices. The example specs included in the Guide will go a long way to making certain you’ve covered all the bases. Your House Building Contract is similarly important. It should cover all of the many contingencies that might arise in your building project. For example, if the builder is late in finishing your house, and you have to move out of your present one and into a rental apartment, who pays for this, you or your builder? Examples abound, but without a good contract, you builder can get away with much and have little accountability for his actions. Take if from me, this is not something you want to learn the hard way. A one-page change order sheet with signature blocks should be included as an attachment to your contract. Administrative costs charged by your builder for changed orders, if any, should be defined. The time to complete your house should be clearly stipulated in the contract, as well as the penalties incurred by the builder if the house is not finished on time. As part of this clause, there should be a clear and unambiguous definition of when the clock starts and when it stops. The builder’s warranties and guarantees should be stipulated in the contract. A clause stating that all workmen should conduct themselves in a professional and business-like manner should be in the contract. A clause stating that no alcoholic beverages or drugs of any kind shall be allowed on the construction site. These Specifications and the Contract documents are provided in a Word format so you can edit or modify them for your own use. If you tried to buy these two documents at one of the sites that sell construction documents you would pay between $29 and $49 for EACH of these documents. Together they represent a $70 value. They are provided free to all purchasers. The information contained in Healthy House Building Tips will surprise and alarm you. Everyone who is building a new house should be aware of the things contained in this document. For those with allergies, chronic illness, multiple chemical sensitivities, asthma, or respiratory illness this information is absolutely essential. The bottom line is that two trends in house building have converged to make the typical new house constructed today less healthy than it was 50 years ago. These trends are the increasing tendency to use man made materials and the construction of “tighter” homes with less outside air exchange. Did you know that the indoor air quality in most new homes is 5-10 times worse than outdoor air, even in the most polluted industrial areas? That is why the information found in the Healthy House Building Tips document is so important. Here is an example section. It’s raining cat’s and dog’s and the roof on your new house is only partly finished. Your builder’s sub has been working on this task for a week already, and you don’t know why it’s taking so long. Should it take a week to finish, or longer? Is someone dragging their feet? Should you complain to your builder, since the water’s pouring in on your partially completed house? Our time line will help you answer these questions. 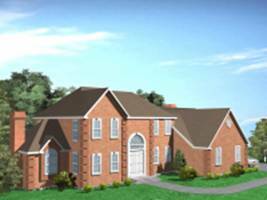 We provide you with timelines for four different houses – a ranch and a colonial – and a 1500 and 300 sq ft. home. While certainly not definitive, this timeline gives you a basic understanding of how long certain tasks should take, and armed with this ammunition you can make decisions and take actions – like talking to the builder about WHY it’s taking so long to finish the roof, when it should have been done in three days. The House Building Task List is a 180 point checklist of items that you should consider when building a house. Assuming your follow our advice and hire a builder, almost all of these things should be his responsibility. However, this comprehensive list will give you the ability to monitor and double check what your builder is doing or should be doing. It’s an invaluable aid to assist you in monitoring the progress of your builder and your house building project. Would you like to know if you qualify for a mortgage? And if you do, the amount that you qualify for. And if you don’t qualify, why not. Now there is a fast and simple way to do this WITHOUT speaking to a broker. Our terrific new prequalification tool takes into account all important aspects of your credit history, income, and expenses and tells you EXACTLY where you stand. Purchasers of the Guide have unlimited access to the use of this tool. Every purchaser of the House Building Guide will automatically receive a free subscription to our acclaimed newsletter. This newsletter covers important and timely topics in the new home construction field. Here are just a few of the many topics covered in recent newsletters. Higher energy costs mean, not only higher cost for gasoline at the pump, but higher costs to heat, cool and live in your home. This Energy report was compiled to assist you in designing your new home to minimize energy costs. It comes with a home energy checklist designed for your use as you build your home. We insist that you order the House Building Guide entirely at our risk. That’s why this Guide and accompanying documents comes with a Risk Free, Lifetime 100% Money Back Guarantee. There is absolutely No Risk on your part. This means you can return it anytime: next week, next year or ten years from now....BUT... you still get to keep the Healthy House Tips. But a guarantee is only as good as the business that stands behind it. House-Building.com is a member of BBB Online, one of the most well known and respected business reliability organizations in the U.S. BBB Online members must subscribe to a code of ethics for transacting business online. Looking for even more security? House-Building's SSL certificate insures that any information you provide to us is secure. The Comodo seal indicates that any sensitive information you give us is encrypted using 128 bit encryption technology. Comodo provides a $2500 insurance policy should the end user loose money from what was thought to be a trusted session. Click on any of these seals to double check Home-Building's status (may be shown as our parent company Todd, Michael and James). Remember all of this important information is available to you within seconds of ordering! By clicking the order button below, you will be transferred to our secure server, where you will complete your order by providing the required information.